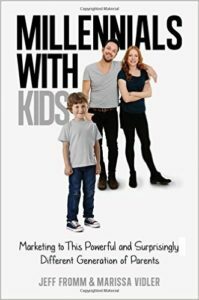 Marissa Vidler is co-author of the book Millennials with Kids: Marketing to This Powerful and Surprisingly Different Generation of Parents, which hit bookshelves in August 2015. Our expertise in understanding the millennial consumer – how they think, how they behave, and how they shop – was parlayed into a book that comprehensively examines this important audience. While everyone was bemoaning their laziness and self-absorption, the millennial generation quietly grew up—and they’re nothing like the clichés we used to describe them. As pragmatic, diverse, digital natives, this massive cohort of 80 million are entering their prime consumer years, having children of their own, and shifting priorities as they move solidly into adulthood. Through a goldmine of interviews, digestible segments brought to life, and examples of brand successes and failures, this book helps marketers rethink the typical American household—and connect with these critical consumers in the complex participation economy.